The workshop was held at NIT Campus, Langol on 22nd March 2015. The function was graced by Dr. Ng. Bijoy, MLA Khurai AC, Chairman (Pollution Control Board Manipur), former VC (Manipur University) and former Director (RIMS, Manipur) as Chief Guest, Prof. V. Subramanian, Emeritus fellow JNU, Delhi as Guest of Honour and Prof. Subashisa Dutta, Head, Civil Engineering Department, IIT Guwahati as Special Guest of the workshop. Speaking on the workshop, Dr. Ng. Bijoy mentioned the importance of cleaning of Nambul River and Wysen Maril canal and asserts about a project related to water issues to be taken up in collaboration with Prof. Shashi Majumdhar from California and his team. The highlights of the programme were the technical talks by the eminent speakers on issues related to water sector, multi scale hydro-morphological processes in the Brahmaputra River using advanced Geospatial technologies, Design of grey water recycling plant for a campus towards holistic approach for self-sustainability of water. 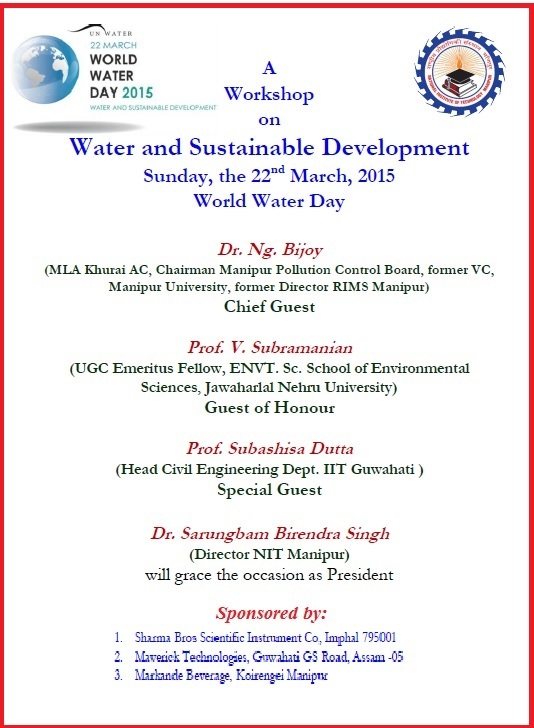 The function was concluded with a panel discussion and demonstration of water Laboratory of NIT Manipur.